Ragsdale Hall at East Carolina University houses a number of departments for the university. For this senior, the Department of Educational Leadership and Graduate School were the most important. The building, built in 1923 at a cost $146,168, was named after William Ragsdale, a board of trustee member who influential in bringing higher learning to Greenville and eastern North Carolina. While the exterior of the building has retained it's original feel, the interior has been updated over the years and fitted to house the current departments in the building. 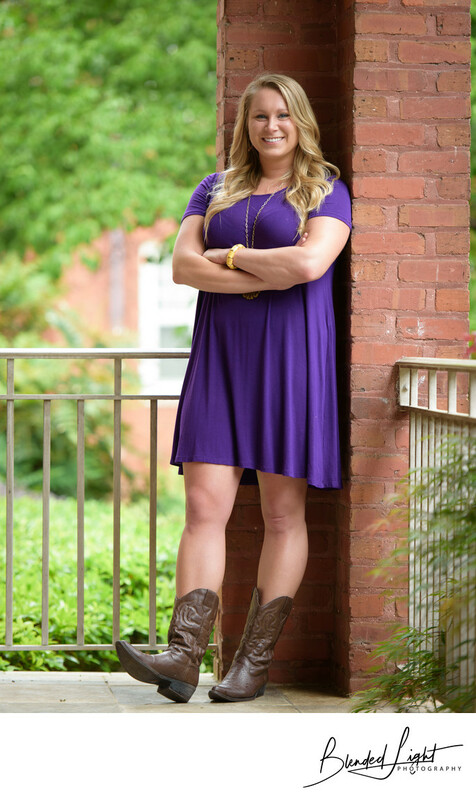 The front stoop of the building is a great location for ECU seniors to use for portraits. Neatly landscaped and trimmed with white weathered railing, the dark bricks seem brighter a little brighter than normal. Using the soft natural light coming in over the building's right front corner, I was able to capture this relaxed portrait of my graduating senior. I used a 70-200 for this shot to compress the background and shoot pretty close to wide open to allow the subject to stand out against the background. Despite shooting at a longer focal length, the full length image captures some of the individual's personality, confidence and style without blending her into the environment. A great portrait showing her as the strong and confident senior she was! 1/125; f/2.8; ISO 400; 155.0 mm.